Balzac, AB – Despite the economic downturn, one Alberta County is reaping the rewards of its innovative ‘Bricks and Clicks’ strategy and low business tax environment. With the boom in online shopping, Rocky View County’s ‘Bricks and Clicks’ strategy is attracting innovative businesses that combine online shopping (clicks) with warehouse fulfillment centres (bricks). Recently, online giant Amazon selected Rocky View County as the location of its 600,000 square foot, state-of-the-art warehouse and distribution facility. As did Walmart, Sobeys, Gordon Food Service and several others. Balzac has become a hub of commercial and industrial growth and a world-class destination for retail and entertainment. While the ‘Bricks and Clicks’ phenomenon is a global trend disrupting retail, Rocky View County’s low tax environment appeals to both tech giants and small businesses and entrepreneurs at New Horizon Mall. Opening a retail business in Rocky View County is almost four times less expensive than Calgary. The total tax burden of operating a business in Calgary, with a retail space assessed at $100,000 is $3888.64. Operating in one of Calgary’s Business Improvement Areas will add between $198.00 and $2070.00 to the cost of doing business in the City. With no business tax, no business revitalization zone levies, no business license fee, the same business would pay $1112.81 in Rocky View County. (See table and background information below). 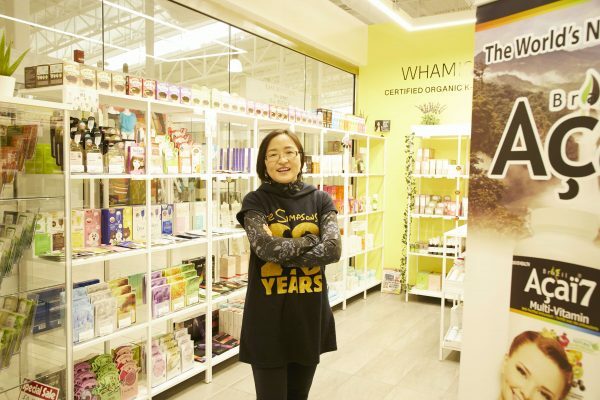 Photo Caption: Sally Seong, owner of Koreana B&H, which provides authentic and affordable cosmetic/beauty products from South Korea at New Horizon Mall. One of 39 stores now open at the Mall and taking advantage of the world-class shopping destination of Balzac in Rocky View County. With leasing options starting at about $1000/month, New Horizon Mall offers affordable options to start or expand a business just south of CrossIron Mills, in the middle of this new vast warehousing community and close to the Calgary International Airport. Standard store units range in size from 145 to 450 square feet and are customized to each tenants’ specification. New Horizon offers a culturally diverse shopping experience featuring independent businesses with products from around the world. It is different by design. All of New Horizon’s units are individually owned, some are owner-occupied and some are leased. The design makes units more affordable for entrepreneurs. As of December 7th, New Horizon Mall has 39 stores open and recently announced the opening of its first food court operator, Matty’s Grill. Other food court operators will be added in the coming weeks. In addition to the open stores, there are another 40 ready to be occupied right now. Each weekend this month, New Horizon Mall is hosting a Christmas Craft and Farmers Market in the atrium. This offers entrepreneurs and vendors the opportunity to be part of the holiday retail environment. Sources: Alberta Municipal Affairs – Municipal Profiles, November 23, 2018. City of Calgary, City of Airdrie, websites. As shown, the tax burden is $2775.83 less for a retail business operating in Rocky View County in comparison to the City of Calgary, and $319.14 less for a retail business operating in Rocky View County in comparison to the City of Airdrie.